Home » Personal Finance » Is It Smart to Pay College Tuition With a Credit Card? At first, the answer seems obvious: Using a credit card to pay your college tuition is a terrible idea. With the high rates that come with plastic, you could rack up thousands of dollars in interest by charging your tuition. But, there's another way to look at it: If you can pay off your credit card bill in full each month, using a card to pay your tuition could generate significant cash back rewards, airline miles, or free hotel stays. The cost of college isn't shrinking any time soon. CollegeBoard reports that the average yearly tuition for a public, four-year in-state college stood at $9,970 for 2017–2018, up 3.1 percent from the previous year. Private colleges averaged $25,620 for the same school year, an increase of 3.2 percent. Neither of those figures include the average $10,800 cost for room and board. If you're going to be charging tuition or room and board to a credit card, you should have the cash on hand to pay it off in a timely fashion — ideally, the first billing cycle. And that won't be a small amount. Otherwise, you put yourself at risk of falling deeply into credit card debt. According to the 2017 edition of Sallie Mae's How America Pays for College report, just 3 percent of families used credit cards to help cover college tuition for their kids, while 4 percent of students used plastic to pay for some or all of their tuition. Parents charged an average $4,450 for tuition in 2017, while students charged an average $1,626. 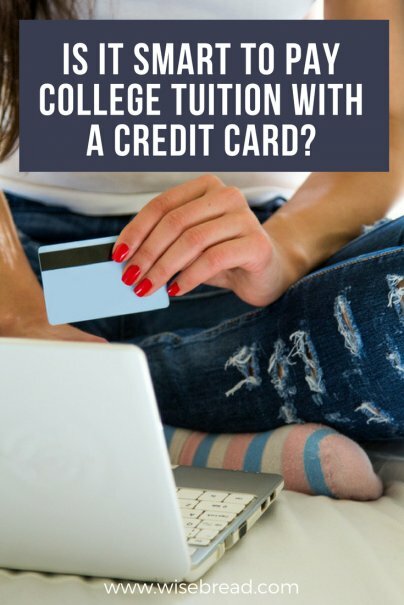 If you can afford to charge tuition and pay off your credit card bill each month, it might make sense to do so, especially if you have a credit card that provides cash back bonuses, rewards, or miles. Charging $10,000 in tuition, for example, could be a great way to earn fast cash or travel credit. The key, again, is that you pay off your card's balance in full when the bill comes due. It's not unusual for credit cards to come with interest rates of 18 percent or higher. If you carry a balance, that interest rate will cause your debt to grow quickly, and no amount of cash back, bonuses, or miles is worth that financial pain. There is another potential pitfall with credit cards depending on the school you attend. If your college or university allows you to charge tuition (some don't), many will charge an additional fee for credit card processing. You'll have to determine if the rewards, miles, or cash back bonuses you're after are enough to make up for the fee your university or college charges. According to a 2016 survey from CreditCards.com, 85 percent of the country's largest colleges allow credit cards for tuition payments. The survey found that 57 percent of schools charge fees for credit card payments, with the average fee being 2.62 percent. Say you charge $4,500 in tuition for your upcoming semester. If your school charged a fee of 2.62 percent, you'd pay about $118 extra for the privilege of using your card. If that $118 is higher than the cash back bonus or rewards points you'd generate from charging it, you're better off paying for your tuition in another way.